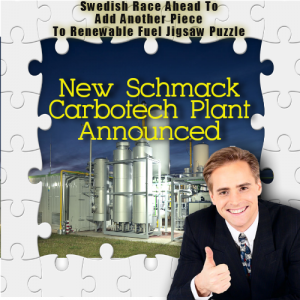 This is our updated article about: Schmack Carbotech – “Sweden’s leading role in bioenergy through biomethane production, with the world’s largest installed biogas upgrading capacity, is set to further pull-ahead”. The first article, which is still reproduced below, was published in August 2014. A lot has changed since then, and biomethane production has risen greatly. 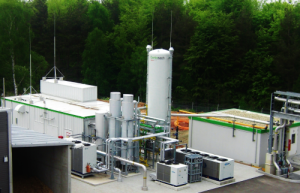 Schmack has built a biomethane plant in France as well now. So, we thought that we would add more general information on biomethane production to start, which we have done below. We hope this will better explain why Sweden was right to go for biomethane back in 2014. Biomethane can be produced either by anaerobic digestion or by gasification of organic matter. 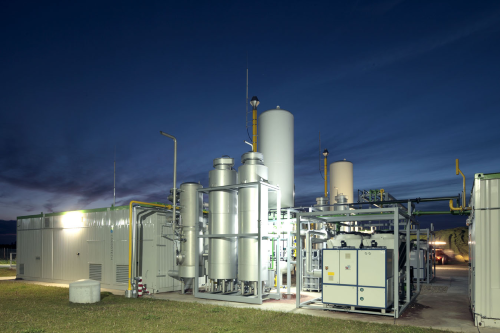 Organic matter fed into the biomethane plant is transformed by anaerobic process into biomethane i.e. a compound of methane (CH4) and carbon dioxide. As of 2016, Biomethane production from biogas was a single largest source, globally. Biogas is upgraded by various gas treatment processes to produce biomethane. During this upgrading process, contaminants are either absorbed or scrubbed from the gas to obtain more methane per unit volume of the residual gas. Gasification converts organic matter into syngas, which is then processed to produce methane. Methane as a whole is about 20 times more potent GHG (Greenhouse Gas) than CO2 if released in atmosphere. When used in power generation, it generates heat and emits carbon dioxide and some other gases. Biomethane is a naturally occurring gas produced by anaerobic digestion of organic matter like plant & animal wastes, manure, sewage sludge, and other organic matter. Thus it has emerged out as a renewable source of energy produced worldwide. Biomethane or Renewable natural gas (RNG) is a pipeline quality gas which is interchangeable with conventional gas. It can be used as a 100% substitute for, or blended with conventional gas streams for use in automobiles. The developed nations of the world are diversifying their energy demand with more renewable sources. The Climate Change Conference held in Paris is one of the major reason for the nations to include more of renewable sources and cleaner fuel options in their energy mix. The key factor driving the growth of global biomethane market is the negative impact of conventional fuels on the environment such as harmful carbon emissions and global warming. Such negative impacts and the continuous depletion of fossil reserves has led to the increase in usage of biomethane as an energy source. As per a research was done by California Energy Commission, biomethane can reduce GHG emissions by up to 87% compared to conventional petroleum-based fuels. The adoption of biomethane as an alternative fuel, along with the above-mentioned factors is driving the global biomethane market. Whereas, the requirement to meet the gas quality standards in international trade, low power output for industries, and high investment costs act as the major hurdles in the growth of the market. Schwandorf, March 6th, 2017. Schmack Biogas, a Viessmann Group company, has been awarded a further contract for the construction of a biomethane production plant in Sourdun in northern France. The planned biogas plant is expected to be able to produce 250 Nm³/h of raw biogas in the first phase of the development. However, the design already includes a possible second development phase to increase production to 500 Nm3/h of raw biogas. The raw biogas will be refined to a methane content of at least 97 percent by means of pressure swing adsorption (PSA process). As a result, the biogas will be of natural gas quality and will be able to be fed into Sourdun’s local supply network. As of 2016, biomethane production from biogas was a single largest source, globally. Biogas is upgraded by various gas treatment processes to produce biomethane. Biomethane can be produced either by anaerobic digestion or by gasification of organic matter. Organic matter fed into the biogas plant is transformed by the anaerobic process into biogas (i.e. a compound of methane (CH4) and carbon dioxide). Gasification converts organic matter into syngas, which is then processed to produce methane. Methane as a whole is about 20 times more potent GHG (Greenhouse Gas) than CO2 if released into the atmosphere. Despite all this shortcomings, biomethane produced from organic matter eliminates the release of a great deal of methane and other harmful gases into the atmosphere. Schmack Carbotech Stockholm: Sweden’s leading role in bioenergy through biomethane production, with the world’s largest installed biogas upgrading capacity, is set to further pull-ahead. It is going beyond the level of all of other nations with the announcement that Schmack Carbotech has been signed-up as the design and build contractor for a 2000 Nm³/h biogas processing facility. The facility will be located to the south of Stockholm. Schmack Carbotech is using their innovative Pressure Swing Adsorption (PSA) technology in their biomethane production. It will be used in a development that will enable the Swedish capital to produce pure methane (biomethane) from more biogas. This will increase the proportion of biomethane it uses by 50%. This will provide biofuel for vehicles currently powered by natural gas. The biomethane production will be of a high purity gas leaving the PSA with a methane content in excess of 97 per cent. Schmack Biogas to biomethane upgrading equipment (2014). The plant will be fed by organic waste and waste kitchen oil. It will be located in Sofielund, Huddinge, and will produce biogas with an annual energy yield of nearly 100 million kilowatt hours. That’s enough to supply approximately 5,000 vehicles clocking up an average of 20,000 km per year each. Part of the Viessmann Group, Schmack Carbotech’s Pressure Swing Adsorption (PSA) principle distinguishes itself from other technologies. It does this because of its favourably low energy consumption, efficient heat extraction and high methane yield. “This important new biomethane production contract at Sofielund brings to bear all of our 30 years ‘experience in the development, engineering and manufacturing of turnkey gas upgrading plants. “As industry pioneers and market leaders in biogas purification, we are very keen to play our part in delivering a low energy yet high yield technology. A technology that in this case fits in perfectly with the Swedish government’s long-term thinking. Their aim is to become the world’s first completely oil-free economy”. As well as being a specialist in upgrading biogas plants, the Viessmann Group is actively implementing complete biogas turnkey solutions worldwide. BioFerm technology is now integral to parts of more than 300 cogeneration and biomethane plants in Europe and beyond. This includes Europe’s largest dry-AD-from-organic-waste plant, located in Fife, Scotland. The Viessmann Group is a leading international manufacturer of heating technology systems. Founded in 1917, the family company has around 11,400 employees with group sales of EUR 2.1 billion. Viessmann has an international presence with 27 production companies in 11 countries, sales companies and representations in 74 countries and 120 sales branches worldwide. 55 percent of sales are generated abroad. These are actually ideas to follow up on regarding biogas. You have made a good point here. But, is Schmack part of Viessmann now? Therefore, is it actually Swedish, or German. If this is German technology the lead is German not Swedish, I say. Any way keep up writing. Sweden is a very good progressive nation. They are advanced in biogas, or should I say biomethane? a lot of spam feedback? If so how do you reduce it? I get so much lately it’s driving me mad. I use the “Spam Bee” plugin. It is really good at identifying and deleting the spam. You still need to keep an eye out though, because it’s not perfect, and some spam does get through I’m afraid. Really enjoyed looking through. 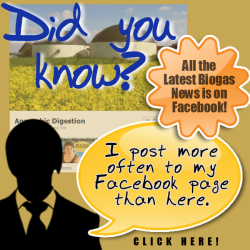 Biogas to biomethane. That’s how they do it. I presume there are other technologies to do this, as well? How does the Carbotech equipment rate for up-time, running cost and overall value for money? I was reading a piece in the news papers on this, so now as I am a user of web I decided to look it up. Thanks to web I see your writing, but now am puzzled. You say carbon dioxide not bad, but everyone else says it is the greenhouses gas. I know you are not like Trump, but am not knowing what to think. The crop for the biomass needed has to be sown, fertilized, probably sprayed, plus harvested and then transported from the farm to the plant. That’s an awful lot of diesel fuel: not very green. so Is it really worth it? Have you heard about NeoZeo? Neozeo provides new biogas upgrading equipment for the production of high value biomethane from raw biogas produced on farms or from municipal waste. They were a winner in the European Business Awards 2017-18. I put their site in the url box for you.